A major report by Amnesty International into the shadowy workings of the terror organization Hamas was released yesterday (Tuesday). It reveals how - in the midst of the massive rocket war launched against Israel by Gaza's Islamist rulers last summer - the Islamists conducted a vicious Arab-on-Arab blood-letting campaign directed at their fellow Gazans. At the time it was underway, the Hamas savagery received scant news media attention (and as far as we know, no photographs) from the numerous reporting teams sent to cover the fighting with Israel. It's by no means clear this will now change. "the opportunity to ruthlessly settle scores, carrying out a series of unlawful killings and other grave abuses... In the chaos of the conflict, the de facto Hamas administration granted its security forces free rein to carry out horrific abuses including against people in its custody. These spine-chilling actions, some of which amount to war crimes, were designed to exact revenge and spread fear across the Gaza Strip... Not a single person has been held accountable for the crimes committed by Hamas forces against Palestinians during the 2014 conflict, indicating that these crimes were either ordered or condoned by the authorities." 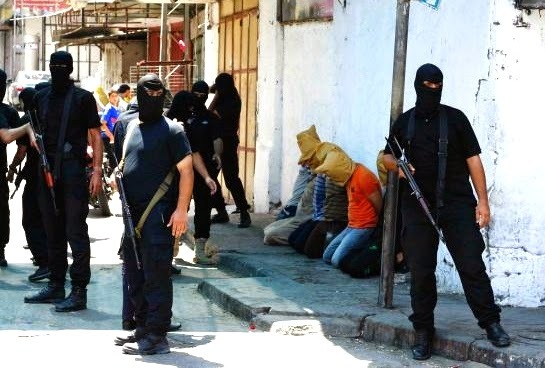 Hamas forces abducted, tortured or attacked members and supporters of Fatah, their main rival political organization within Gaza, including former members of the Palestinian Authority security forces. 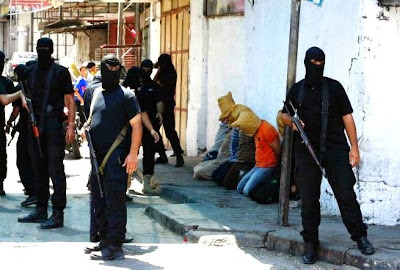 As well as carrying out unlawful killings, others abducted by Hamas were subjected to torture, including severe beatings with truncheons, gun butts, hoses and wire or held in stress positions. Some were interrogated and tortured or otherwise ill-treated in a disused outpatient’s clinic within the grounds of Gaza City’s main al-Shifa hospital. "Hamas authorities and leadership have continuously encouraged and facilitated these appalling crimes against powerless individuals. Their failure to even condemn the unlawful killings, abduction and torture of perceived suspects leaves them effectively with blood on their hands," said Philip Luther. [Quoting the Gazan brother of a Gazan victim of the Hamas barbarians:] "Even if he had been sentenced to death, there would have been an appeals process and other alternatives. What they have done is nothing to do with justice, it’s just criminal..."
The specific case of Ayman Taha gets special treatment in the Amnesty report itself. Taha's father had been one of the founders of Hamas and the son was Hamas' representative to Egypt’s intelligence authorities. It's interesting that what follows below is barely mentioned in today's news coverage of the report. News reports on August 7, 2014 (an example is below) said Taha's body had just been brought to al-Shifa Hospital in Gaza. But that's not exactly right. Amnesty provides the previously-missing background: Taha had been detained by Hamas' al-Qassam Brigades on January 23, 2014 and since that time had been in a state of "totally disappeared". In fact, Taha's body had turned up at al-Shifa three days before those August 7, 2014 news reports - dumped at the hospital's front door with bullet wounds to the head and chest. Then (keep track) it disappeared for a few days - no explanation is offered - and then turned up a second time which is when the reports appeared in the Arab papers. Hamas had conceded back on February 22, 2014 that "it was holding him on charges of misconduct, corruption and profiteering", though Amnesty points out that it knows of no formal charges having been brought against him. 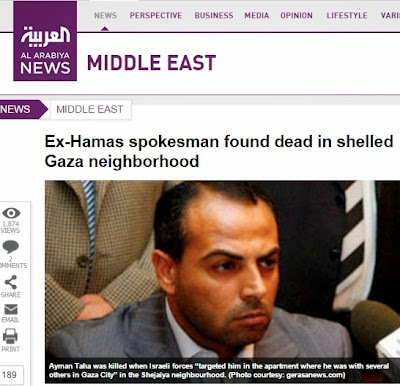 Thanks to what Amnesty has disclosed, and no other media outlet till now, it is fairly plain that Hamas was inventing stories to cover its acts of score-settling, rival-eliminating murder. A pity the global news syndication agencies (including AFP) skipped over that part of Amnesty's document in today's news items. "The Hamas leadership repeatedly calls for rights and justice for Palestinians in Gaza and elsewhere... Hamas forces have displayed a disregard for the most fundamental rules of international humanitarian law. Torture and cruel treatment of detainees in an armed conflict is a war crime. Extrajudicial executions are also war crimes... [T]he Hamas authorities are dragging the name of justice through the mud and condoning these appalling crimes..."
for creating a “situation of chaos” during the war. Mushir al-Masri, a spokesman for Hamas, said that Israel had attacked the Gaza security services, preventing them from managing Palestinian internal affairs properly. "The Amnesty report about Hamas needs to be more precise," Mr. Masri said in a telephone interview. Stand by for an emergency meeting of the UN Security Council, condemnation of Hamas by the UN Human Rights Council, and flying pigs. You need to update the URL; Amnesty seems to have shifted the page. As for the rest: well said.